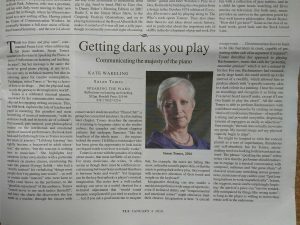 The Times Literary Supplement of January 4 has a lovely review of my book ‘Speaking the Piano‘. Because of the subscriber paywall, only a snippet of the review is publicly accessible online, but here’s a photo of the review as it appears in print. The year got off to a flying start with a mention of Winterplay in The Scotsman‘s preview of concerts to look forward to in 2019. 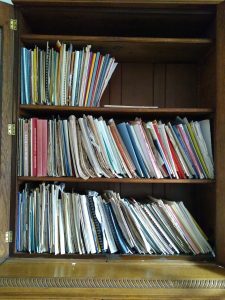 In addition to the events mentioned in The Scotsman, there’s also a pre-concert talk (free to ticket-holders) at 6.30pm by Robert Philip whose previous talks have drawn a large audience. 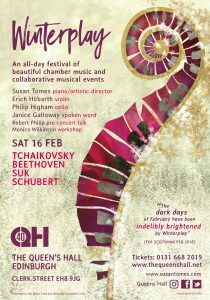 Winterplay is on Saturday 16 February 2019. Tickets are available online or through the Queen’s Hall box office (0131 668 2019). Join us for this celebration of chamber music!